When The Quran speaks about Prophet Solomon and David it starts with knowledge and says: And we gave a great knowledge to David and Solomon. The fundamental and basis of the change and revolution in a human society is knowledge. Knowledge here consists of all the science of a divine society. 1) The reason that the word “knowledge” is singular is a sign of its importance. In this verse knowledge has a broad meaning. The formation of a divine government is impossible without having great knowledge. This knowledge consists of all sciences that are required to rule a human society. After Prophet David and Solomon talk about God’s blessing of great knowledge and science, they immediately thank God and summarize their superiority to others in having knowledge. 3) Considering the other verses in this regard, the knowledge in this verse which is about bird’s speech, is the knowledge of communicating to birds. In Jewish culture, Solomon is the symbol of wisdom and skills which are beyond the capabilities of a human being. The connection between wisdom and Solomon is clear in the books of Chronicles and Kings. In these books, Solomon is an indication of wisdom. Solomon, by his wise ruling inside an outside the country, is a representation of his science and knowledge. Among the assorted collection of Jewish religious books of Old Testament, the book of Proverbs, Ecclesiastes and Songs of Songs are attributed to Solomon. 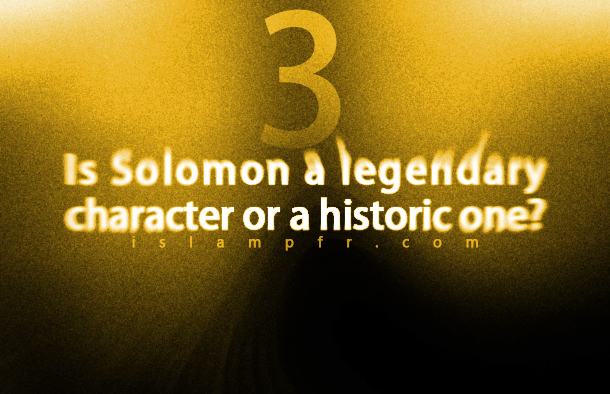 Also in the Biblical Apocrypha series of books, the Wisdom of Solomon is attributed to Solomon. In the book of Pseudepigrapha (6) of Old Testament that means “faked writings” (7) the book of Psalms and Odes of Solomon are attributed to him. The reason why Songs of songs has been placed in the collection of books of the Old Testament is a mystery yet. This book is collection of Jewish songs which were sang by lovers to describe each other and Jews read them in wedding ceremonies. Interpretation of this book is about humans love but Jews interpret its lyrics as relationship between God and Israelites. (12) There are other cases in the Bible that are interpreted as a religious marriage. (13) In the collection of Pseudepigrapha books there are several pages of “Songs of song”. “Wisdom” is one of the Apocrypha books of Old Testament. Some of the church priests such as Origen, Jerome and Augustine doubted to attribute the “Wisdom” to Solomon. This book has named Solomon’s wisdom in Septuagint and it has named “Wisdom” in Vulgate. Priests believe that the unknown author of the book has used wisdom fame of Solomon and has called his book “Wisdom”. Some people believe that this book has been written about 1 century B.C in Alexandria. There is in “The Muratorian canon” (14) that “Wisdom” is written by Solomon’s fellows in his honor. Why did David choose Solomon as his successor? While David was judging in the presence of the scientists of the Israelites and Solomon, a man came and said that someone’s sheep destroyed his grape garden at night. Judicial sentence is clear and guaranteed. According to the Bible, Solomon asked God to give him a wise heart to distinguish bad and good things to judge among people. (19) God granted his wish. One of the judgments which is mentioned in the Bible is about two women who gave birth to their babies. One of them said: “O my lord, both of us live in the same house and we gave birth to our children, approximately, at the same time, that is, 3 days after I gave birth to my child, she gave birth to her child too. Moreover, we were alone in the house and no one was with us. And they were quarreling at the presence of king. The king said: this woman says that the alive son is mine and the dead one is yours and the other says it is not true and the alive son is mine and the dead one is yours. To solve the problem, the king asked fora sword and said cut the alive son into half and to each of these women give a half. . The real mother loved her son and said: “give him to another woman and don’t kill him”.